elsewhere is a multi-projection video art work which seeks to phenomenally transform the reinforced concrete landscape of the Malmö C underground station into a wide open space. 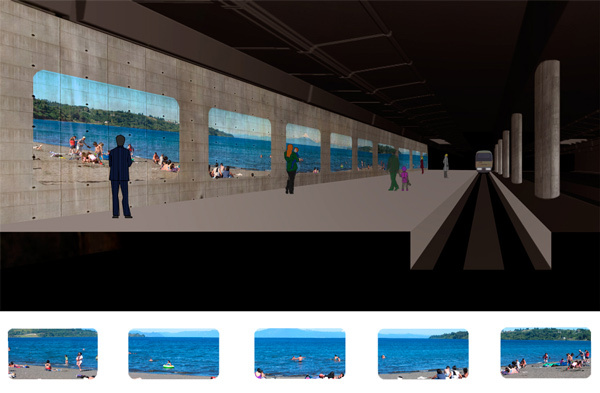 Through a projection device that evokes the perceptual experience from the train, the viewers will be invited to lose themselves in images during their wait. The projections acting as windows, the station itself becomes a train that loses its spatial and temporal rails, itinerant across the earth. From the salt flats of Uyuni to the roads of Saigon, from the plains of Siberia to those of Patagonia, from the Honshu-Shikoku Bridge to the Orinoco River to central Montreal to the outskirts of Rio de Janeiro to Johannesburg’s Soweto to a Kensington street to Oaxaca market to Plaza Mayor to the Sicilian coast to Jalpur to Alexandria to Fortune Bay to Kualalampur to Ulan Bator to Den Haag to Reykjavik to Marienville to Tallinn to Corbridge to Buenaventura to Faisalabad to Muscat to Adana to Kinshasa to Xiangkhoang to Arrecife to Krakow to Pusan*… the Malmö C station will travel the world. elsewhere, like a lost river, flows continually into an underground passage. It is said that one never steps in the same river twice; comparably, the elsewhere installation is elaborated in such a way that it is unlikely that a viewer on a fixed schedule will see the same image time and again. In terms of tempo, elsewhere is conceived as a release for the individual viewer. The recorded images are slowed down, in contrast with the speed of everyday urban life, in order to ease the experiential flow of time. In symbolic terms, this artwork highlights the importance of the Central Station as a node; in its primary sense, as a crucial railway link, but also metaphorically as a connection between the city and the entire world.